In order to access the data from a database at the front end, programmers are querying using SQL. Most of the programmers are following their own style of coding. 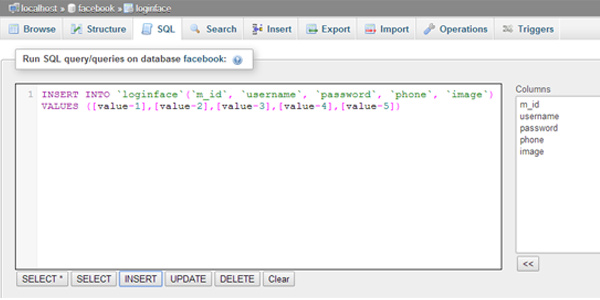 There is a better way of doing it using phpmyadmin sql builder. They can use the inbuilt sql builder in phpMyadmin which can fetch the data from you localhost server. Why phpmyadmin sql query builder? Every individual programmer have own style of querying the database. So it is always difficult for other programmers to understand the query written. So to make it easy to understand we have to follow some common standards, this standard is provided by phpmyadmin. 1.start Wamp server/xamp localhost server phpmyadmin. 2. Create Database and table structure. 3.Click SQL menu (show below image). The major advantages of using phpmyadmin sql builder are error free querying reduces large data of coding and also reduces large amount of time spending in querying. We can see basic queries like “SELECT”, “SELECT *”, “INSERT”, “UPDATE”, “DELETE”. However we can use all other queries like JOIN queries and I’ll explain about them in next post.